Since there is no oil pump in a traditional two stroke engine, two stroke oil is added to gasoline to lubricate the engine. 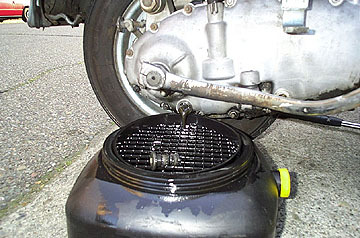 The oil coats parts as the gasoline is drawn through to the combustion chamber, and is then burnt along with the fuel. This is where the typical "blue smoke" comes from and unfortunately the main reason legislation exists against two strokes. There are two main types of two stroke oil on the markets: non-synthetic and synthetic oils. I hope to add to this page in the future with more info, but for the most part the only difference I have seen on standard motors using synthetic vs. non-synthetic is that the inside of the motor and piston area is much cleaner after many miles using synthetic. Any comments on this would be appreciated. For more than you ever wanted to know about oil click here. A two stroke engine lubricates the piston, crank, and flywheel side bearing separately from the gearbox and clutch lubrication system. This is done by mixing a 2-stroke oil in with the gasoline. As gasoline is drawn into crankcase, oil is deposited onto the various parts as well as being burnt in the combustion chamber (hence the famous 2-stroke blue haze). Older bikes had a much higher oil to gasoline ratio than the more recent bikes. 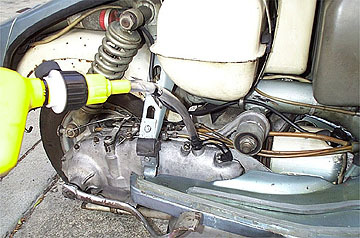 Most Vespas made after 1980 and the Lambretta 75SL ' Cometa' have automatic oil metering devices with a separate oil tank. A mechanical system mixes the correct amount of gas and oil for the motor. Vespas with this feature can be identified by a conical sight glass which is visible just below the fuel tap lever. Note: BE VERY CAREFUL. The wrong mixture can seriously affect your engine and can even result in a piston seizure. If you are unsure of what ratio your bike requires please find your model for the correct information. Older scooters usually take about 5% (20:1) - 6% (17:1) and newer scooters are usually 2% (50:1). I have also included 3% (32:1) because many tuned motors use this ratio. A two stroke engine lubricates itself in two separate ways. The gearbox, clutch, and drive is lubricated by standard gearbox oil. There is no oil pump. Instead, the gears running in the oil manage to pass enough oil around the gearbox to lubricate it properly. Gearbox oil in a scooter should be changed about every 3000 miles with new ST 90 gear oil, which is the same as SAE 30 motor oil. For some reason oil manufacturers have different viscosity definitions for motor oil vs. gear oil. This is a constant cause of confusion when buying transmission oil for your scooter. If in doubt remember that oil for car engines is crankcase oil and oil specifically for scooter transmissions is gear oil. Below are directions for any Lambretta series I through III. It is a good idea to run the bike awhile so the oil will get hot and flow much more easily. Place the bike on its kick stand on level ground and remove the right hand panel. Find the lower of the two large allen head cover caps noted as (1) below on the chain case cover. Please note that the bike in the picture also has the rear right footboard removed but this is NOT necessary to change the oil. 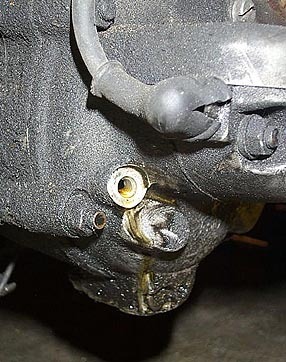 Place an oil pan directly below the cap and unscrew it in an anti-clockwise direction to remove the plug. Be careful not to lose the small sealing washer around the outer rim as this can be reused if necessary, although it's best to replace it altogether. This plug also contains a small magnet which attracts any small metal pieces that are loose in the oil. It should be cleaned when removed. 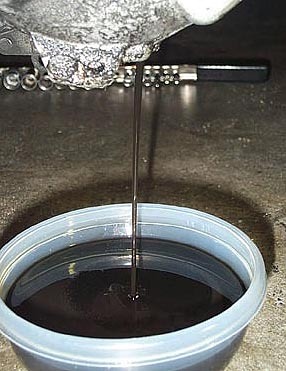 The oil should immediately flow out until the gearbox is drained. 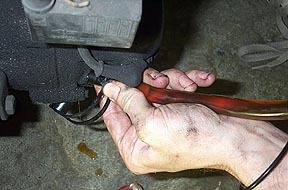 Once drained, refit the oil drain plug and tighten carefully. The plug is only meant to seal against oil leaks so go easy! It is very easy to strip in the soft aluminum casing. If possible use a new felt washer to seal it rather than reusing the original. Be sure the bike is relatively level and locate the second chain case allen head cap (2 in the photo above) and remove it. This second small hole is simply used to see when the gearbox is completely filled with about 1 1/4 pints (0.7 liters) of oil. Find the filler hole and remove the large 21mm bolt with a domed cap and a small breathing hole. This is on the top of the chaincase near the main exhaust mount (see below). I use an attachment that screws onto a standard quart size bottle of oil to fill up my bikes. I found it at my local Kragen auto parts store. It keeps things clean, is easy to use, and is relatively inexpensive. Start filling the gearbox until the oil reaches the upper sight hole. Once this is done, refit the upper sight hole allen head cap bolt with a new felt washer and tighten down the filler bolt. Take the bike for a spin and once things get hot, make sure there are no leaks. Lastly, please dispose of your oil responsibly. It can be extremely harmful to the environment if simply dumped. Most recycling centers will take it for no charge. A two stroke engine lubricates itself in two separate ways. The gearbox, clutch, and drive is lubricated by standard gearbox oil. There is no oil pump but instead the gears running in the oil manage to pass enough oil around the gearbox to lubricate it properly. Gearbox oil in a Vespa scooter should be changed about every 3000 miles with new SAE 80 gear oil, which is the same as SAE 30 motor oil. For some reason oil manufacturers have different viscosity definitions for motor oil vs. gear oil. This is a constant cause of confusion when buying transmission oil for your scooter. If in doubt remember that oil for car engines is crankcase oil and oil specifically for scooter transmissions is gear oil.. Below are directions for most large frame Vespas. These instructions generally apply to small frames Vespas as well but the filler and drain holes are in different locations. It is a good idea to run the bike around for a while to get the oil hot as it will flow much more easily. Place the bike on its kick stand on level ground and look underneath the right hand side of the engine. You'll see a small bolt that (if it is not covered in grime) should have OLIO printed on the head. Below is a shot of the oil drain bolt location on a large frame. 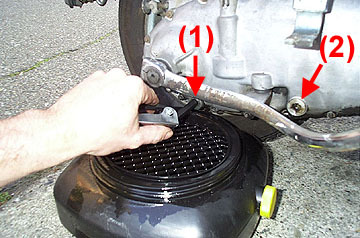 Place an oil drain pan below the bolt and loosen it allowing the oil to drain. Be careful not to lose the small sealing washer around the outer rim as this can be reused if necessary although it is best if replaced. 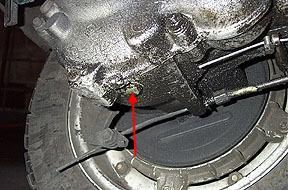 Once the oil plug is removed the oil will flow out of the crankcase into the oil pan below. Once all the oil has drained out, refit the oil drain plug, but only turn it about 1/2 to 1 turn past finger tight. Once the oil has drained refit the drain plug with a new felt or brass sealing washer. DO NOT tighten more than about a 1/2 to 3/4 of a turn more than hand tight. The small diameter and soft aluminum casing make it easy to strip the threads. If you find that the threads are stripped or you strip them yourself I have had success with using white plumbers tape around the threads. It can be bought at any hardware store and is basically a very thin plastic tape that plumbers use to seal threads when connecting gas or water lines. Wrap a 2" length around the threads and carefully tighten it in place. Find the oil filler hole which is just to the rear and slightly below the gear selector box. Remove the slotted bolt with a large screwdriver. The new oil goes in this hole and needs to be filled up to the filler hole level when the bike is on the stand on level ground. I use an attachment tube which screws on to a standard quart of oil. These are available at most auto parts stores. The shot below shows the oil just at the filler hole level, (and a little dribbling out. 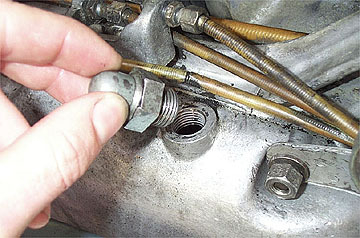 Refit the oil filler screw/bolt and double check you are not getting any leaks from the oil drain plug below. Auto parts stores will take your old oil for recycling and should not charge you for it. Most recycling centers will take it for no charge and it really does mess things up if you just dump it. 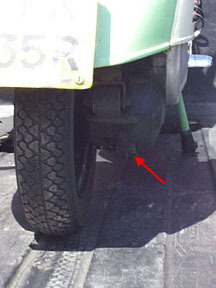 The oil drain hole is located just under the lowest point of the casing on a small frame Vespa. 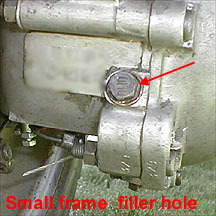 The filler hole is located just below the rear shock mount on a small frame.